Thurston Outdoor Education Centre, run by South Tyneside Council, lies on the north east side of Coniston Water. 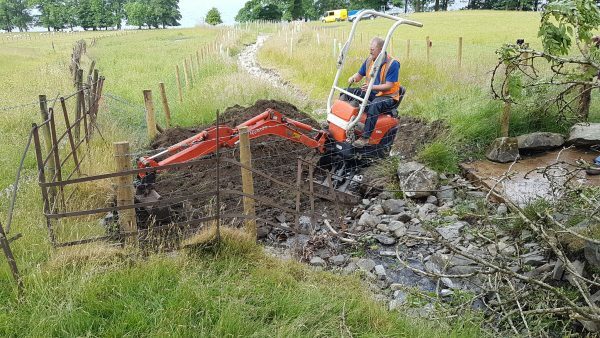 In 2016, the Centre installed a small scale hydro-electric scheme and as part of the consent for the scheme an environmental off setting project was included. 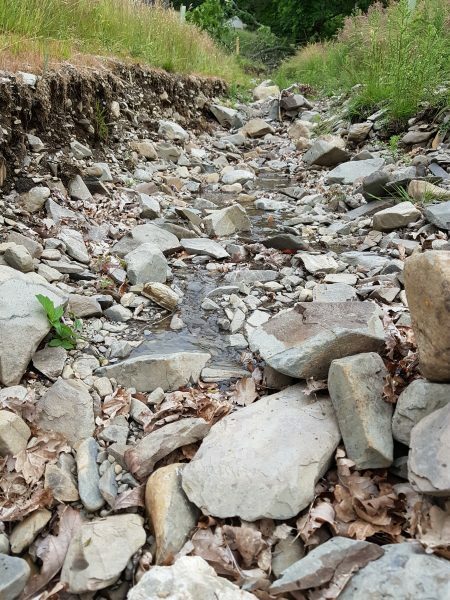 This specified the restoration of a fully open and re-naturalised water course. There was an existing culverted beck which flowed underground but it was decided by the Centre to create a new 160m channel, wholly on Centre land. The channel was excavated in Autumn 2016, this was quite straight and at the lower end, over 2m deep. 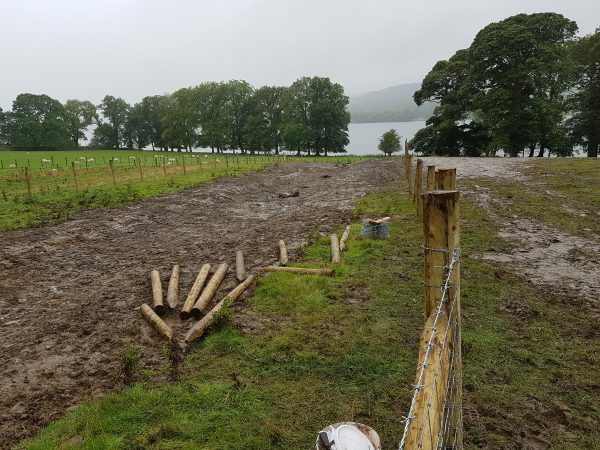 Working in partnership with Thurston OEC, the HLF Conserving Coniston & Crake Project was able to provide expertise and financial assistance to naturalise the new channel. 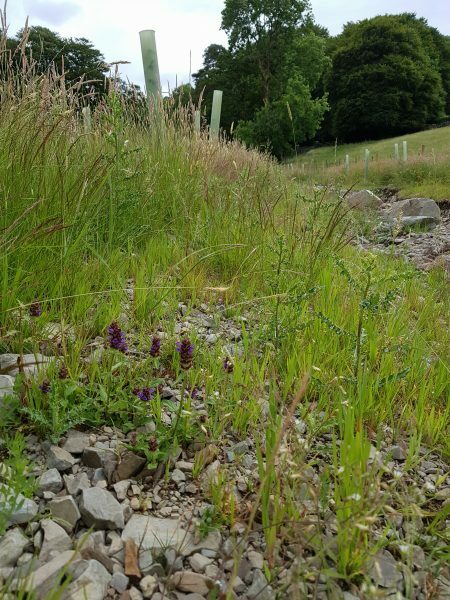 In 2017 the channel banks were regraded to lessen the steepness and reduce the risk of undercutting through erosion, gentle meanders were added and the area reseeded. As the land was grazed by livestock the new section of beck was fenced off, creating a 3m wide buffer strip on each side. 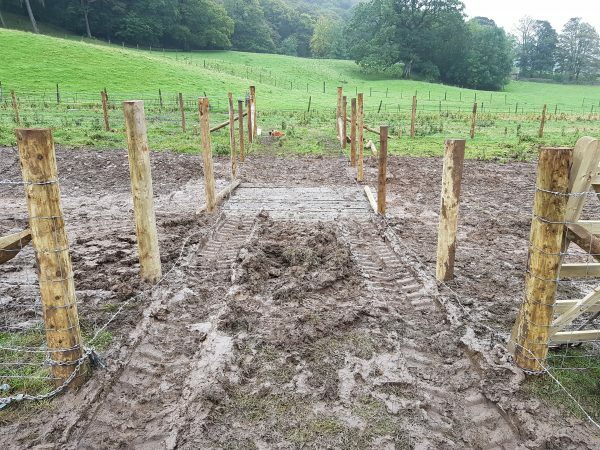 Excluding livestock from entering the beck reduces sediments from entering the watercourse, reduces the risk of erosion and once vegetation establishes, provides improved habitats both in-river and along the banks. Gates and a stock crossing point were also installed. The naturalisation will benefit salmonids, eels and freshwater invertebrates. 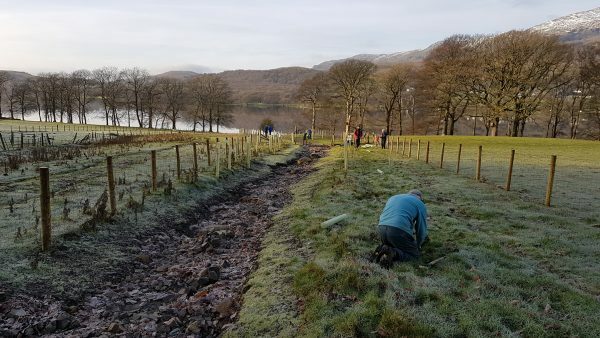 In December 2017, volunteers from Conserving Coniston & Crake worked with staff from the Centre to plant 120 native trees in the buffer strip. Rules concerning river works meant that the new beck remained blocked at both ends for a year, allowing the newly seeded area to establish. Before the earth bunds were removed, straw bales were staked into the channel to act as sediment filters, which will be left in place until the water is running sufficiently clear. The bunds were successfully removed with the join between old and new beck reconfigured slightly to improve the water flow. The beck will be monitored over the next few weeks to make sure the flow is as it should be – a natural process winding down to the lake. The buffer strip is now nicely green, with a good mix of grasses and wildflowers, providing good habitat for butterflies, moths and small mammals. 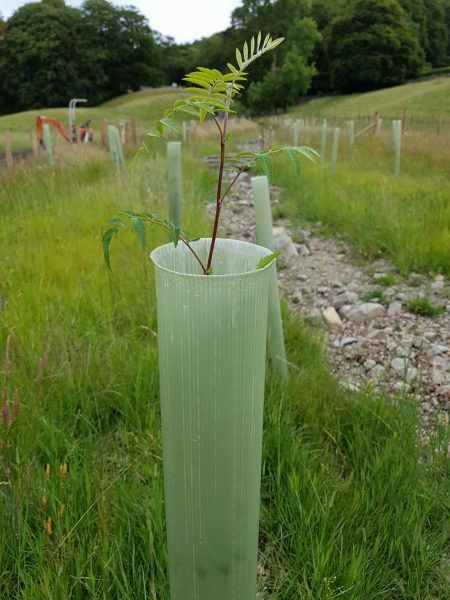 The trees planted at the end of last year have taken well, some now showing above their protective tubes and as these grow they will add sections of shade to the beck, improving the in-river habitat for invertebrates and fish.